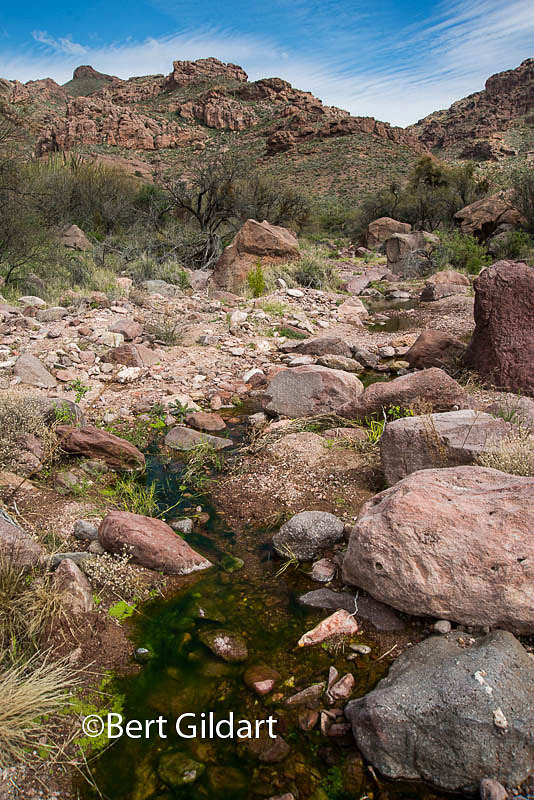 ©Bert Gildart: Three years ago Janie and I hiked the Alamo Canyon Trail in Organ Pipe National Monument – and it was here that we encountered a group of illegal Mexicans stealing along the stream bed. They were carrying large backpacks highly suggestive of drug smuggling, and the experience was unsettling. Silently, they glared at us and we glanced back. Turning, they clamored out of the boulder-strewn stream bed and clawed their way onto the far bank. Then they disappeared into the brush. We scurried back to our truck, and then as park instructions requested, we reported the incident to park headquarters. The experience was, in fact, alarming, and so disconcerting that we have never returned to Alamo Canyon. But the beauty of the canyon remained fixed in our memories, and because it has been haunting us, and because of increased security measures to help insure visitor piece of mind, yesterday, we returned. Alamo Canyon is, in fact, a splendid area, lush with both organ pipe and Saguaro, which you see immediately as you hit the trail. 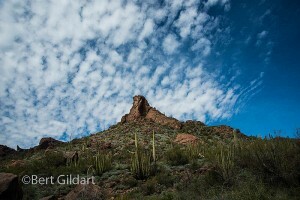 They flank the path and frame the Ajo Mountain Range, whose jagged ridge juts into the blue desert sky. 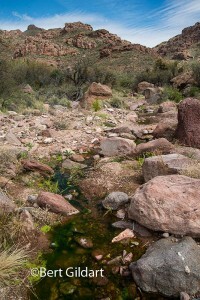 A stream parallels the trail and because of recent rains it was trickling, creating condition reminiscent of the features that apparently attracted, Bill and Birdie Miller who homesteaded here in the early 1900’s. Initially, they build an adobe home, but in the 1920’s the couple replaced it with a brick structure that still stands today. Alamo Canyon that so characterizes this gem of Organ Pipe Cactus National Monument. About 100 yards past the old brick home, we found a set of corrals and at this point we ran across park volunteer Lee Campbell. Ironically, we had attended his digital slide show only the night before. 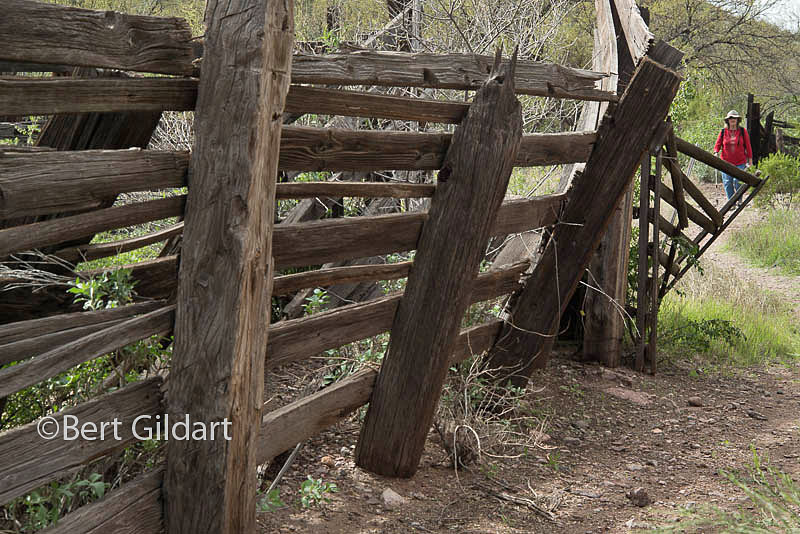 He said the corrals were constructed in the early 1930s. He also said that Bill Miller left his wife Birdie and that she managed the cattle all alone. Eventually, however, she sold everything off to the Grey family, whose ranching efforts we had explored several days earlier. 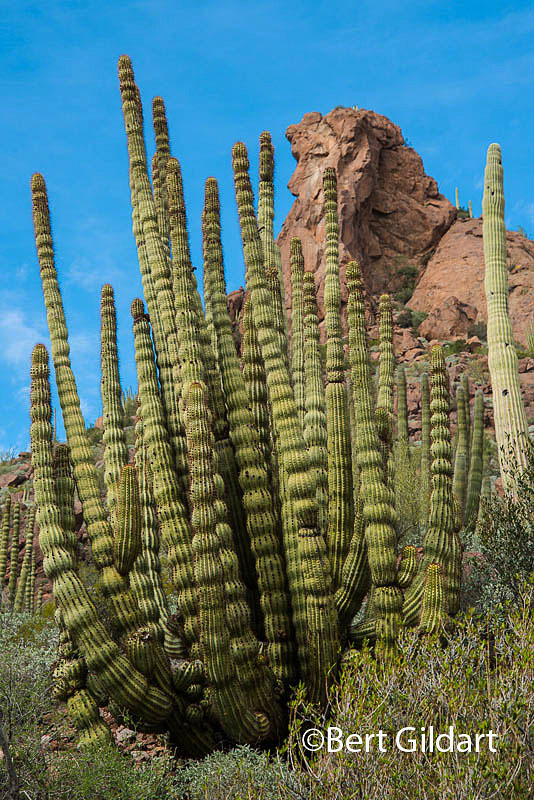 For us, Alamo Canyon now stands out as a gem in the Sonoran Desert, offering what we believe are some of the monument’s best and most intriguing groupings of saguaro and organ pipe. But equally as important, we believe that when we think Alamo Canyon it will be yesterday’s adventure we think of first, rather than of our encounter in January of 2012 with a band of illegal aliens,who may have been transporting drugs. This entry was posted on Tuesday, February 24th, 2015 at 8:05 am and is filed under National Lands, Natural History/Conservation, Photography, Travel. You can follow any responses to this entry through the RSS 2.0 feed. You can leave a response, or trackback from your own site.